Network Visualization: Visualize your network and security infrastructure. RedSeal’s cybersecurity analytics platform provides complete network visualization and allows you to maximize your network’s digital resilience by providing a comprehensive view of your network and security infrastructure. RedSeal builds a model of your network that provides an accurate map of your physical, cloud, and virtual networks. RedSeal creates a complete network construct by using Layer 2 and 3 configuration data from network devices, retrieved dynamically or offline. Then, RedSeal imports vulnerability assessment data in standard Common Vulnerabilities and Exposures (CVE) format from your vulnerability managers. With this knowledge of your network, RedSeal is able to take network access into account when prioritizing vulnerabilities. This allows RedSeal to distinguish every possible network path and recognize whether a target is even open to compromise. Continuous Monitoring: Measure and continuously monitor your security posture. As it creates your network model, RedSeal uncovers “unknowns” in your constantly morphing network topology, including dangling links, undocumented network pieces, and unscanned networks. This comprehensive inspection allows RedSeal to report a risk-based audit of your network and provides continuous monitoring of your security posture. A continuous diagnostics program conserves government resources, delivers cyber situational awareness and reduces the chance of network disruption. With continuous monitoring, you can track how your network resilience is trending over time, why it is improving or degrading, and what is causing those changes. 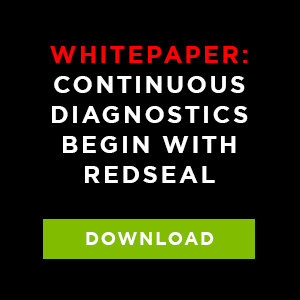 RedSeal is a comprehensive, continuous monitoring solution for diverse and dynamic networks.